Morgan Jones playing the HTC Vive virtual reality system at Middlesbrough VR in the Dundas Market. Virtual Reality has reached Middlesbrough town centre thanks to a Teesside University student. Morgan Jones has launched Middlesbrough VR in the town’s Dundas Market and Shopping Centre to offer virtual reality experiences throughout June. HTC Vive virtual reality systems create a 360-degree virtual reality world for players of games such as first person shooter Zombie Training Simulator, award-winning Job Simulator, plus a range of other games and experiences. 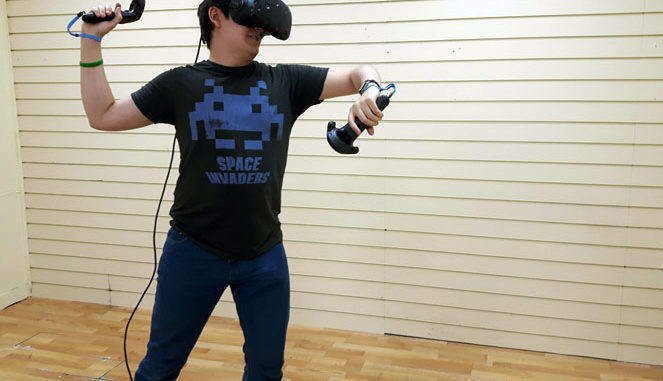 A Computer Games student who has just completed his second year at Teesside University, Morgan started Middlesbrough VR after buying the HTC Vive system for himself. He says: “My friends were amazed at the quality of the experience and were always wanting to play, but it’s expensive to buy the whole system, so I thought I could run a business over the summer and make the experiences available to everyone at a low cost. Dundas Market Manager David Harris said: “We want a broad range of traders in the Dundas Market, so if you have got a business idea like Morgan, please get in touch and we will do all we can to help. Middlesbrough VR is open from 9am to 5pm, Mondays to Saturdays from 30 May to 30 June. Sessions at Middlesbrough VR cost £5 for 10 minutes, or £15 for 30 minutes. They can be booked by calling 07380 295872 or messaging via www.facebook.com/MiddlesbroughVR/. Bookings can also be made in person in the Dundas Market.